What do you get when you mix Grotto Prophets from New York, New Jersey, Tennessee, and Pennsylvania? A howling good time! Throw in a Grotto Ceremonial and some Halloween festivities, and you’ve got yourself one heck of a party! On October 27, 2013, members of five Grottoes – Azim, Delco, Islam, Zelmar, and Ubar – converged on the Spring Garden Conference Center, located in Middletown, PA, for the October meeting of Ubar Grotto. More than 50 Prophets were in attendance, all enjoying the Sympathy and Good Fellowship that Grotto brings. This being the annual October meeting of Ubar, Prophets were encouraged to attend in their best Halloween getup. 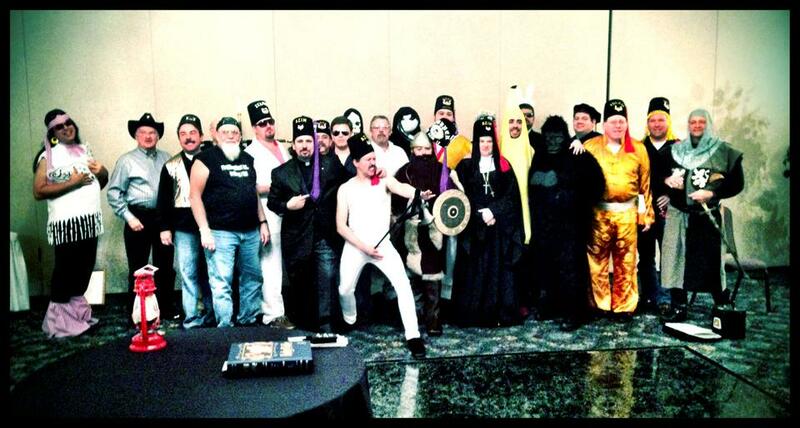 Members were attired as vikings, gorillas, nuns, romans, pop stars, cowboys, and even a banana! With the business of the organization concluded, the Prophets assembled for the Ceremonial of the Order. Ubar Grotto was pleased to welcome 10 Prophets into the Realm. The Grotto was also pleased to confer the work on the Prophets from Zelmar Grotto, who had not yet seen a Ceremonial. After the meeting concluded, Prophets continued to socialize, enjoying cigars in the gazebo outdoors. It was a fine meeting and a fantastic last ceremonial for 2013. All Prophets are invited to join Ubar for its last meeting of the year, to be held on November 24, 2013. This will be the second Convivial Meeting of the year, so Ubar members do not need to pay for their meal. Come out and join us!